BillHustonBlog: Kinder Morgan NED: Biggest freaking compressors I've ever seen!! 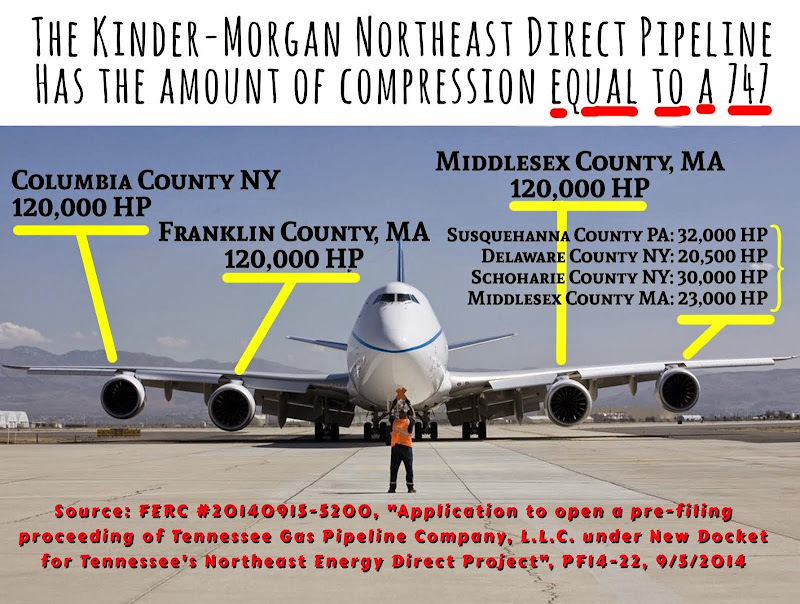 Kinder Morgan NED: Biggest freaking compressors I've ever seen!! I don't know quite what to make of this, so I am just reporting to you what I've found. "Request to implement the Commission's pre-filing procedure for the Northeast Energy Direct Project"
Under Accession Number 20140915-5200, "Application to open a pre-filing proceeding of Tennessee Gas Pipeline Company, L.L.C. under New Docket for Tennessee's Northeast Energy Direct Project " under FERC docket PF14-22. Someone from Franklin NY asked me to look up the air emissions for the proposed Franklin Compressor. It's bad enough-- either 20,500 HP or 30,000 HP, with typical emissions at 100,000 tons per year in Greenhouse gasses (CO2e). Keep in mind the TOTAL amount of new compression for the entire Dominion New Market project is 33,000 HP over 3 sites at 11,000 HP each. So the proposed Franklin compressor is 3 times the typical big transmission line compressor I've seen. But then I noticed that the compressors between the Wright (NY) Interconnect and Dracut Mass are the biggest I've ever seen. I about fell over. 3x Titan 250's @ 120,000 HP each. These are the largest commercially made compressors available, and ~10x the size of the typical compressor I've seen (I've looked at many). 120,000 HP happens to be about equal to 90 Megawatts, or the output of a GE90 jet engine found in the largest aircraft, like a Boeing 747 or 777. So the total compression proposed for the KM NED project is about 480,000 horsepower, which is the equivalent of 4x of the biggest jet engines made. Total horsepower = 485k HP. All are turbines except the "Market Path Head Station" in Schoharie (pipeline junction) which are reciprocating. Total HP for turbines: 465k HP. 465kHP * 4.9 tpy/HP + 20kHP * 9.8 tpy/HP = 2.3 Million tpy + 196k tpy = 2.5M tpy. 2.5 MILLION TONS PER YEAR. Total GHG emissions for KM-NED = 2.5 MILLION TONS PER YEAR in emissions. 1M tons = coal train 100 miles long. 2.5 M tons = coal train 250 miles long -- from NYC to Rochester. To put that into perspective, the biggest emitter I've ever seen to date was Dominion Cove Point, which is estimated to be 2.0 M tpy of CO2e in GHG emissions. Wow / What the Hell? Where is all this gas coming from? I keep finding a bigger monstrosity then I've ever seen before.